Blending a Hair Stylist extraordinaire with over 25 years experience and a retail management graduate turn stay at home mom of 11 years was fate playing a good hand in life. When the opportunity presented itself to Debbie to "trade up" her salon in size from 400sq. ft. to 2000sq. ft. she immediately answered “YES!” However, what came next was a pleasant surprise. Debbie, upon sharing the news with a client (Jeannine Haley), who since 2005 was becoming one of her closest friends, offered to assist with the design and renovation of the new space. 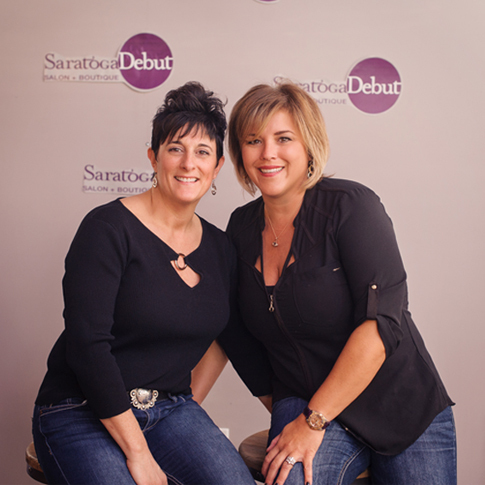 As the conversations of design, color and look of the new space cultivated, Debbie and Jeannine had a brilliant idea… they decided to merge talents and create Saratoga Debut Salon & Boutique. A place where a salon for hair care and nails becomes an experience offering the latest in the world of hair, while hosting a boutique filled with a unique selection of gifts, complimentary gift wrapping and a personal shopping experience.